New Jersey nerdcore rapper Attack Slug has released his newest effort, entitled Endsville is Burning. 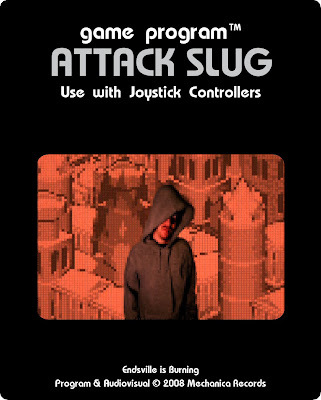 You can download the album free from Attack Slug's website. Working with other famed nerdcore artists like T.Y.T. and KABUTO, and rapping over beats from the likes of DJ Snyder and OCRemixer Franz Keller, he makes a distinct and interesting disc. The album is nine tracks long and clocks in at just under half an hour. Definitely worth a listen as Attack Slug has a style all his own. My favorite track? Why Earth Defense Force no doubt! He even has some EDF remixes up from Don Vito, and our pal IllGill, be sure to check out those remixes too!